Introducing the convenient Green Works Pump ‘N Clean, the newest addition to the green yet powerful portfolio of naturally derived cleaning products. Just dispense the cleaning liquid on your rag or sponge with a single pump, wipe and go! Plus, it’s safe to use around food so you can clean your kitchen as you cook, eliminating the big mess at the end of your meal prep. Use for quick surface cleaning, dishes, cutting boards and more! 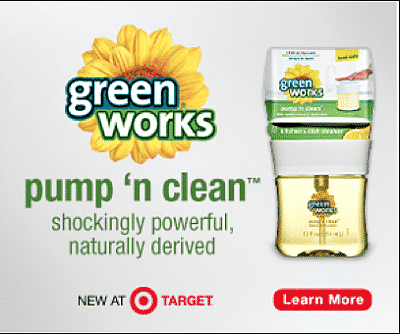 Cartwheel Offer: From June 14-July 11, use the Target Cartwheel app to save 10% on all varieties of Green Works products (including Pump ‘N Clean). So glad this deal is helpful for you, David!